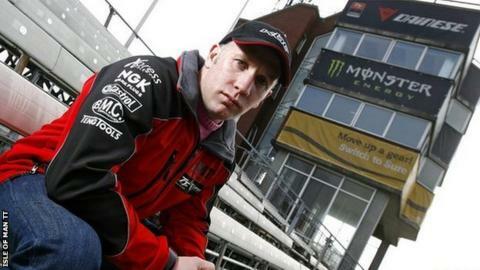 Tributes have been paid to the three-time British Supersport champion, Karl Harris, who died while riding in the Isle of Man TT on Tuesday. The 34-year-old from Sheffield crashed in an area known as Joey's Corner on the final lap of the Superstock race. Clerk of the TT course Gary Thompson said: "Karl's infectious enthusiasm and sense of humour lit up many race meetings. "He was a hugely talented racer and will be sorely missed." He is the second racer to die at this year's event after Bob Price lost his life in Monday's Supersport opener. MotoGP star Cal Crutchlow said on Twitter: "Really sad to hear Karl Harris passed away at the TT. One of most natural talented riders I ever raced against. Great guy too." Formula 1 driver Jenson Button tweeted: "Another legend lost to the Isle of Man TT. My thoughts are with all of Karl 'Bomber' Harris's family and friends at this difficult time." World Superbike rider Jonathan Rea said on Twitter: "Terrible hearing that Karl Harris has died. A great guy who'll be remembered as one of the most naturally gifted on a motorcycle!" Former MotoGP star and BBC commentator Steve Parish tweeted: "Really sad to lose a mate, Karl 'Bomber' Harris today. Chasing his passion. RIP. My thoughts are with his family." Isle of Man TT star Conor Cummins said he was an "unbelievable rider and a top bloke". Seven-time world champion Carl Fogarty said he was "gutted beyond words". Organisers said the coroner of inquests had been informed and an investigation was under way. Harris made his debut at the Isle of Man event in 2012, finishing 21st in the Superbike race and 28th in the Superstock race, lapping in excess of 121mph. A spokesman for organisers ACU said: "The ACU wishes to pass on their deepest sympathy to Karl's family and friends."